Identifying Characteristics: (Native Fish) Most notable characteristic is the 5 rows of bony plates (scutes) that become less distinguishable in adults. Lake sturgeons have a large protrusible, suctorial mouth on the bottom side of the head with 4 barbels in front of the mouth and beneath the snout. Lake sturgeons have a single dorsal fin located far back near the caudal (tail) fin. The tail is heterocercal with the upper lobe much larger than the rounded lower lobe. Lake sturgeon have no simple scales, the body is covered by dermal denticles on tough skin. Juvenile lake sturgeon are a sandy brown color with black blotches, while adults are olive-brown to grey with white underneath and lacking black blotches. Lake Sturgeons inhabit large river and lake systems primarily in the Mississippi River, Hudson Bay and Great Lakes basins. It has and continues to represent an important biological component of the Great Lakes fish community. 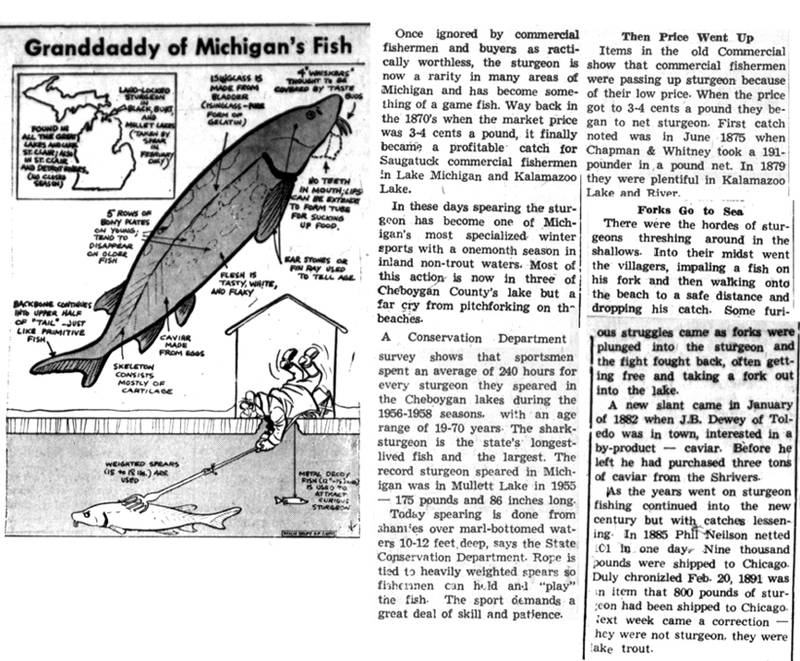 By the early 1900's many populations of lake sturgeon throughout their range had been greatly reduced or extirpated as a result of overfishing, habitat loss, the construction of dams, and pollution. Lake sturgeons are listed as a threatened species in Michigan and either threatened or endangered by 19 of the 20 states within its original range in the United States. This ancient family of fishes has been recognized since the Upper Cretaceous period (136 million years ago), at a time when dinosaurs were at the height of their development. Lake sturgeons have retained primitive internal structures such as a cartilaginous vertebrae and a notochord, instead of calcified bone as found in modern fish. Lake sturgeons are the only sturgeon species endemic to the Great Lakes basin and are the largest freshwater fish indigenous (native) to that system. Lake sturgeon can be considered a nearshore, warmwater species with water temperature and depth preferences of low 50s to mid-60oF and 15-30 feet, respectively. Lake sturgeons are benthivores, feeding on small invertebrates such as insect larvae, crayfish, snails, clams, and leeches that they find along the bottom. Life history characteristics of lake sturgeon are unique with respect to other Michigan fishes. Sexual maturity in females is reached between 14 and 33 years, most often from 24-26 years; and, 12 to 17 years for males. Female lake sturgeons spawn once every 3 to 7 years while males spawn every 1 to 4 years. Spawning occurs on clean, gravel shoals and stream rapids from mid April to late May in preferred water temperatures of 55-64oF. Female lake sturgeon may lay 4,000 to 7,000 eggs per pound of fish. The typical life-span of lake sturgeon is 55 years for males and 80-100 years for females. The current state record for a legally harvested lake sturgeon is 193 pounds taken from Mullett Lake, Cheboygan County. Habitat selection by lake sturgeon varies widely throughout their range and environment that they inhabit. Some adult lake sturgeons have been found to remain in a small territory during the summer months, while others have been observed long distances from their original capture site one year later. Adult sturgeon are known to intermix in the Great Lakes during non-spawning periods, but habitually return to spawn in streams where they were born (homing behavior), often migrating long distances up rivers in the spring. After hatching, some young lake sturgeons have been observed to remain in their natal rivers for their first summer of life. Join friends and neighbors for a momentous environmental occasion! Hatchery-raised lake sturgeons will be released into the Kalamazoo River during a celebration from 10 a.m. to 2 p.m. Saturday, September 24, at New Richmond Bridge County Park, 3160 Old Allegan Road, Fennville, Michigan. There is no charge for this event that includes the sturgeon release, tours of the hatching and rearing facility, music, food, the opening of the swing bridge walkway, and a children's fishing derby. Fishing equipment and bait provided. With the sturgeon release planned for 12 noon, there will be a Native American blessing from members of the Match-e-be-Nash-She-Wish Band of the Pottawatomi Indians of the Gun Lake Tribe who have been intimately involved in this effort to raise and release these young sturgeons into the river. "There are certain roles and responsibilities of all the clans, and we as Anishinabe people respect the relationship we have with the natural world," Tribal Councilwoman Punkin Shananaquet said. "Dodem or Clan which literally means from 'whence breast I come' and is part of who we are as Anishinabek  (Potawatomi, Ojibwe, and Odawa) or the Three Fires Confederacy. It is another form of family and tribal kinship that form our framework of government and way of being or life." "There is also a cultural connection that predates this project," Liz Binoniemi-Smith, the Match-e-be-Nash-She-Wish Band's Environmental Director said. Tribal Councilwoman Shananaquet explained that the Name" or Sturgeon Clan is referred to as the Ogema or Chief Clan of the fish pantheon along with theTurtle that also holds the title of Chief or King." The Fish Clan people or Water Clans, as they are often referred to, are considered the philosophers and spiritualists; those who interpret and provide spiritual knowledge and guidance. Colors for the clan are "animate" meaning they move and provide life, and are blue, green and silver. Fish Clan people are often regarded as mediators in tribal disputes with their words and/or decisions being final. As Councilwoman Shananaquet continued detailing this unique cultural connection, she said, "We observed upon the thousands of generations in the existence of the fish and how important a role they have with the water, the lakes, the creeks and streams. The survival of water is critical with the inhabitants of those who live within that environment." There is not only a cultural perspective involved in this project, but there is also an historical perspective. "Like the life of the fish, Sturgeon Clan people often survive to an old age; and before the arrival of the European, the life span of our people easily reached 130 years. Our connection and restoration of the sturgeon is our ability to survive. Like our ancestors, the sturgeon was taken almost to the point of extinction. There are accounts of the sturgeon being stacked like lumber  the meat left to rot because the effort was only to take the eggs, or the caviar, for use in rich 16th  20th century diets. Whereas our philosophy is use all parts and respect the life it is about to provide for you and your family, your community, and your Nations. This is a critical point in our history not only for restoration, but also to reclaim the connection for sacred life. Our Tribe is very proud of the fact that through cooperation  our environmental knowledge, our teachings and the spiritual sense of Kina Gegoo  all things in creation are sacred is being looked upon as viable for all nations of color," the Councilwoman said. "The Tribal approach to sustainable management of resources is to recognize the impact that current actions will have on the next seven generations. The long life of the sturgeon requires management of resources with this forward looking approach." Ms Binoniemi-Smith added. These newly released sturgeons will stay in Kalamazoo Lake, spending most of the fall and winter in this water before migrating into Lake Michigan. The hatchery, a mobile rearing facility, operated by the Michigan Department of Natural Resources, is located at New Richmond on the north side of the river at the edge of the park's boat launch site. Water drawn from the Kalamazoo River is circulated into the fish holding tanks. As the fish have developed from the eggs captured in the larval drift earlier this year into the 8 to 10 inch length fish that will be released on September 24th, they are imprinted from this particular river's environmental code and return to this portion of the Kalamazoo River where they were released to spawn. Female sturgeons may live to be 80 years of age; males, 65 years. With the females having to be approximately 20 years old before they spawn, it is important to capture and raise significant numbers of males and female sturgeons. The males live in Lake Michigan until about the age of 12 years before they return to their breeding ground to spawn and the females won't spawn until about age 20. Sturgeons were once found extensively throughout the Great Lakes; however, they are now a threatened and protected species and are found infrequently in these waters. They are slow growers, but can reach significant weight up to 300 pounds and have a life expectancy of anywhere from 60 to 100 years. 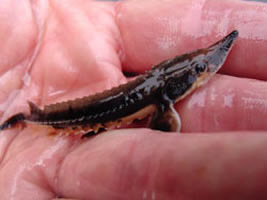 "The mission of the Kalamazoo River Sturgeon for Tomorrow, New Richmond Chapter is to support the reestablishment and maintenance of a healthy, self-sustaining Lake Sturgeon population in the Kalamazoo River system by assisting fisheries managers, promoting public education, furthering scientific research, and engaging in other activities consistent with Sturgeon rehabilitation," said Al Weener, the organization's president. Along with the Match-e-be-Nash-She-Wish Band of the Pottawatomi Indians of the Gun Lake Tribe, other sponsors of this sturgeon release celebration include the Kalamazoo River Sturgeons for Tomorrow, The Allegan County Parks Commission, the Michigan Department of Natural Resources, and Friends of the Wolf Lake State Fish Hatchery.